Not getting into the flow of your book as easily as you would’ve liked to? Oh, it’s the end. You’re totally done for. No worries! Here are some personal tips to know before your long awaited reading session or handy things to keep close by to be sure you’ll be extra comfy as you snuggle up with your book! I’m not sure about anyone else, but I know that I always feel more comfortable when my room is clean (or at least cleaner) and freshly decorated! First, you should find a comfy and quiet spot to read; for most of us, that could mean a bean bag chair/a pile of pillows in a room. If you share a room with unfortunately a sibling, find a spot where you can relax such as the couch but if you really don’t have anywhere in particular at your home, the public library offers some quietness too. If you feel that you know the theme of the book you’re currently reading pretty well, you could incorporate some themed decorations into your room! So if you have any book posters for the book, you could bring those out and even make some book themed DIYs to amp up the room setting! Maybe you can even bring out those festive fairy lights to have on while you flip through your book (which is basically a tumblr type setting but if it’s your kind of thing, “You go, Glen Coco!”). I dunno about you but I’m feeling – like I could read in this room forever. Tired of sandwiching a ticket stub or a folded napkin between your books? Here is an ensemble of my personal top 10 fresh & cute DIY bookmark ideas that anyone can make to add a little zest to your summer reading! * They’re great as summer projects and as gifts to all book lovers! *We don’t own any of these photos or ideas but simply found them to share! 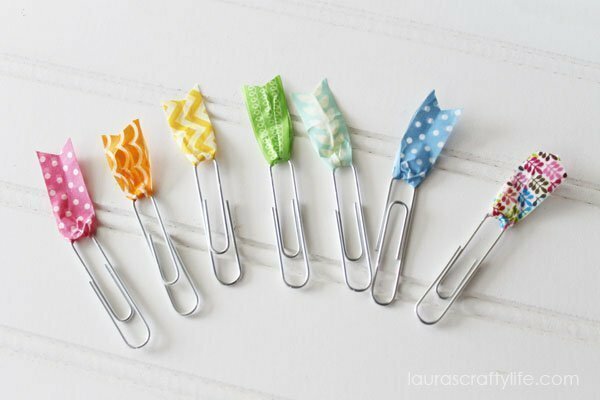 This handy bookmark only takes some Washi tape and paperclips! A super quick and cute DIY that will liven up the colours in any book!